To celebrate 21 years since Etienne le Riche set out on his own, a tasting of the Richesse 2014, the 2005, 2009 and 2014 vintages of the standard label Cabernet Sauvignon, the 2011 vintage of the CWG Auction Reserve and the 1999, 2007 and 2014 vintages of the Reserve Cabernet Sauvignon. Discussion inevitably turned to changes in alcohol levels over time (the Reserve 1999 at 12.5% and the Reserve 2014 at 14.6%) and Christo le Riche, Etienne’s son and current winemaker, suggested that a whole gamut of factors might be responsible: virus-free planting material, clones which ripen earlier and better, more open canopies, more efficient yeasts, critical intolerance of “green” aromas and flavours and even the effects of climate change. Even so, he said that he and his father had tried to keep the approach to winemaking as consistent as possible over time so the increase in alcohols left him “slightly baffled”. The stand-out wine of the day was the 2005. On the nose, a top note of violets before red and black fruit plus a little earthiness in the background. In the mouth, it appeared medium bodied and none too developed, the finish long and gently savoury. Alcohol by volume? 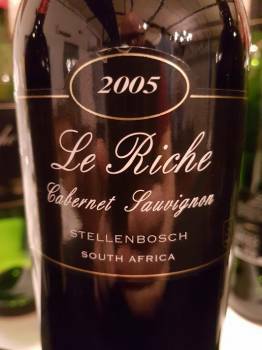 14% which so often seems to be the sweet spot for Stellenbosch reds. Next article“Smells like burnt matches” – how much reductions is a good thing on Chardonnay?